Suitable for all hair types, including children’s fine hair. 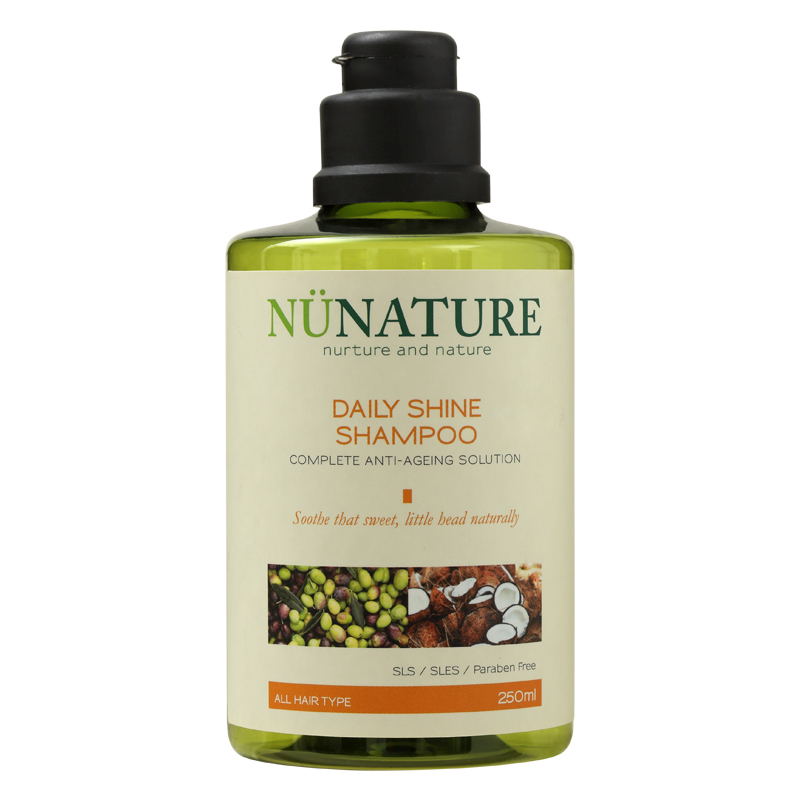 Revitalise your hair with Nunature Daily Shine Shampoo that is perfect for daily use. This ultra-mild formula is suitable for everyone in the family including children. It gently cleanses and provides hair with its daily dose of proteins. Containing Indian Kino Tree Extract, a potent anti-ageing ingredient that enhances your scalp and hair with antioxidant nutrients, this shampoo harnesses the goodness of plant-derived oils and Hydrolyzed Protein to shield your hair from environmental aggressors. Coconut Oil is rich in Vitamins E and K – essential building blocks for healthy hair, while Coconut Oil adds shine and softness for a fuss-free, easy to manage hair. As the first step in natural hair care solution for completely healthy hair, this family-friendly shampoo improves your hair’s lustre and elasticity as it strengthens the strands to prevent breakage due to brittleness. Pour a small amount of shampoo into the palm of your hand. Gently massage your scalp in circular motion using light pressure to stimulate micro-circulation. Rinse thoroughly. Suitable for all hair types, particularly those with sensitive scalp. Calm and soothe your sensitive, stressed scalp with Nunature Scalp Treatment Shampoo. Formulated using mild and naturally-derived ingredients, it gently cleanses without aggravating itchy and/or inflamed scalp. Containing Indian Kino Tree Extract, a potent anti-ageing ingredient that enhances your scalp and hair with antioxidant nutrients, this shampoo is carefully curated to include the best of nature’s wonders in nourishing your sensitive scalp and preventing hair loss. As the first step in natural hair care solution for completely healthy hair, this shampoo restores balance to irritated scalp and provides you with strong, beautiful hair. Suitable for dry, damaged or frizzy hair in need of hydration. 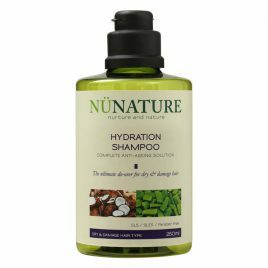 Replenish your hair’s moisture with Nunature Hydration Shampoo that provides essential scalp nourishment for healthy hair. This moisturising shampoo strengthens dry and damaged hair and provides optimal hydration to reduce hair fall. Containing Indian Kino Tree Extract, a potent anti-ageing ingredient that enhances your scalp and hair with antioxidant nutrients, this shampoo also features Hydrolyzed Keratin to restore your hair’s lost protein due to age and chemical treatments. Other key ingredients include Coconut Oil and Guar Extract to condition hair with radiance and softness as well as providing a hydrating shield for scalp to nourish strong hair. As the first step in natural hair care solution for completely healthy hair, this shampoo restores shine and hydration to your hair for a less frizzy mane. Cleanse and condition your hair with Nunature 2-in-1 Shampoo for a healthy shine. This 2-in-1 formula provides your hair with its daily dose of proteins and a protective sheen against environmental pollutants in just one step. Containing Indian Kino Tree Extract, a potent anti-ageing ingredient that enhances your scalp and hair with antioxidant nutrients, this shampoo includes Guar Tree Extract, an excellent conditioning agent, and Lavender Extract for better blood circulation that eventually strengthens hair and prevents hair fall. As the first step in natural hair care solution for completely healthy hair, this shampoo rinses away the day’s dirt and grime to reveal soft and lustrous hair. Suitable for all hair types, particularly those with weak hair follicles causing constant hair fall. Overcome hair loss with Nunature Anti-Hair Fall Shampoo, a proprietary blend of natural botanical extracts to promote cell regeneration and stimulate hair regrowth. This shampoo boosts your hair and scalp health by activating the stem cells in your hair follicles. Containing Indian Kino Tree Extract, a potent anti-ageing ingredient that enhances your scalp and hair with antioxidant nutrients, this shampoo also lists Pea Peptides as one of its active ingredients with cell regenerative and anti-ageing compounds. The addition of Peppermint Oil helps to control inflammation and itchiness caused by irritated scalp. It also lends a soothing, cooling sensation while improving blood circulation to your scalp. Roots are sufficiently nourished from within to effectively strengthen weakened, brittle hair. As the first step in natural hair care solution for completely healthy hair, this shampoo helps you to achieve fuller-bodied hair and regain its volume.